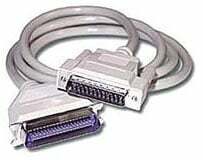 Intermec Parallel printer cable - 6 ft. Parallel printer cable. The Intermec PCM-1100-06 is also known as Intermec Technologies	CAB-PARPC6	or PCM110006	.